ART created from sea-borne bruck washed up on beaches is taking centre stage in the latest exhibition at Shetland Museum’s Da Gadderie. Loise Walpole’s display Weaving Ghosts, which runs from Saturday until 10 April, mixes recycled flotsam and jetsam with Shetland’s age-old traditions of weaving and basketmaking. Walpole hopes to use the show to raise the issue of consumerism, as well as the lost Shetland art of using indigenous plants to create sustainable products. Explaining the exhibition’s title, she said: “The weaving bit is simple – it is what I do as an artist and basketmaker. 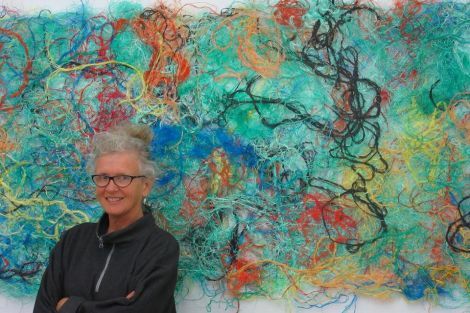 Walpole added that her interest in reusing materials like washed-up rope may have stemmed from her Shetland roots. “Wanting to make something out of nothing has always been a driving force for my work,” she said. “Maybe I inherited this from my Shetland family, though for them it was a necessity rather than a choice. Shetland Museum and Archives exhibitions officer John Hunter said Walpole was a “master” of giving discarded objects new life. “Beaches littered with brightly coloured plastic jab our conscience but at the same time we’re attracted to the vibrancy,” he said.